Facebook has realized that many people are more interested in “breaking news” than the most popular stories (as automatically chosen by Facebook). Especially those who return to the site a few times a day for the latest buzz prefer to have an unobstructed view of the most recent events. 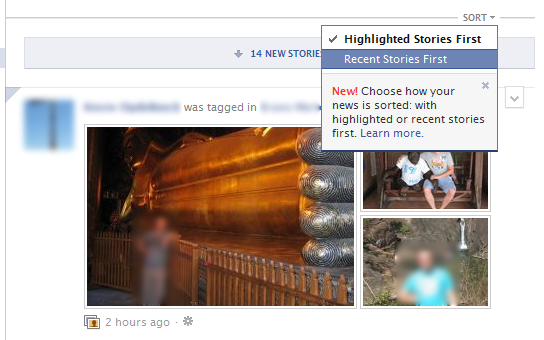 That’s why after prioritizing “Highlighted Stories” since back in September, FB now enabled a sorting option that lets you choose how updates are sorted in your News Feed. Posted by Pieter on November 11, 2011 at 8:37 PM. Use this trackback if you're linking this story.